Discover Real Business Process Integration! Office Manager, from Office Automation, combines enterprise class document management, email and communications management capabilities with sophisticated business process management and automation; and easily integrates with existing ERP and database solutions. You have the flexibility to use components of Office Automator's suite of products such as document management (DMS) or email and communications tracking (ECTS). Alternatively use the full suite to completely automate your business processes and records management for a contract or project, a division or the whole business, even a group of companies. 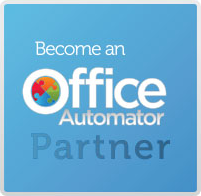 Office Automator today released their latest application "EC Automator" especially developed for Electrical Contractors or in fact for almost any trade business in managing almost every aspect of their business. As the application is simple to modify we can make the system work to how you want to operate. No compromise needed. This product has been created to service all businesses associated with construction of almost any form. Take control of your business, projects or jobs in a way that empowers the owner and your personnel.